Are we tired of the weather yet? Are you tired of hearing me talk about the weather yet? Probably. I saw a meme today that said "Most of you think it's April. But it's actually the 96th of January". All I can say is that it took me three hours to get today's outfit pictures. I'd take a few, and then the heavens would open up and the hail poured down. Over and over again. Today we're talking florals. I've got a bunch of lighter colors waiting in my closet, but since it's only the 96th of January, I decided to wear this dark floral from Loft. Now that I look at it, the entire outfit is a Loft creation. Except the peep toe, open heel booties that I purchased recently from Nordstrom Rack. They fit true to size, have a lower heel, and are oh so comfy. 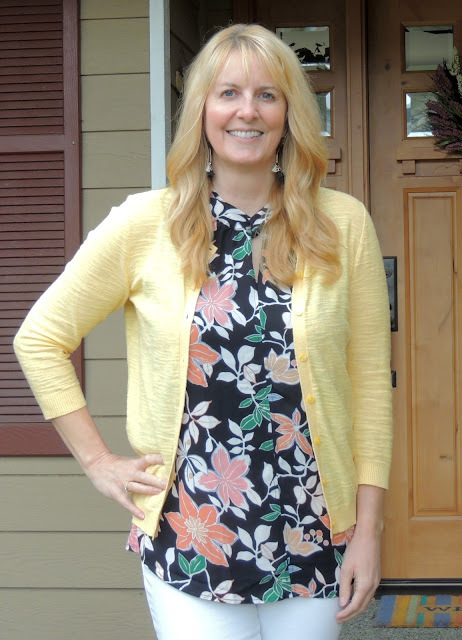 I wouldn't normally wear this top with yellow, but I'm trying to trick spring into showing up. 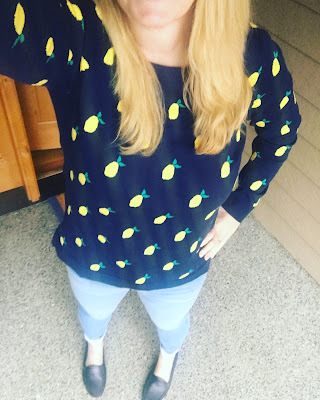 I even wore lemons yesterday. I added some fun black and white tassel earrings. It seems that the earrings are even bigger this spring. How are you all storing these huge earrings? I can't figure out what to do with them and would love suggestions. Speaking of suggestions, where do you stand on florals? My mom, who's generally pretty fashionable, hates them. I can't get enough. Thoughts? 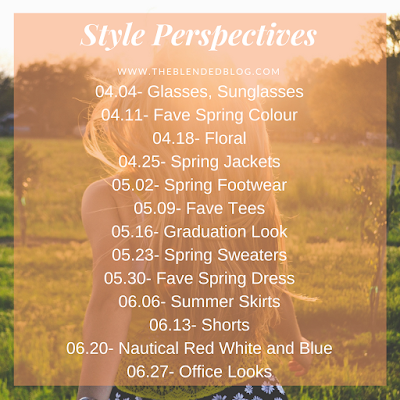 We've chosen some style prompts for the next few months, and I hope you'll join us! I am with you on the weather - it keeps snowing where I live, and I couldn't even make it to work yesterday there were so many accidents. I love the dark floral and the yellow cardigan! One of my favorite looks. Great floral on you Lana! I cannot believe you guys are still having so much cold. I'm trying to soak up our chillier mornings while I can as I know it will be hot and humid before long. Honestly, the weather is getting ridiculous at this point! We've had record rain and cold this month. First---crack me up about the 96th of January!!! Ha ha ha ha!! And I can't believe your mom doesn't like florals. Have you asked her why??? 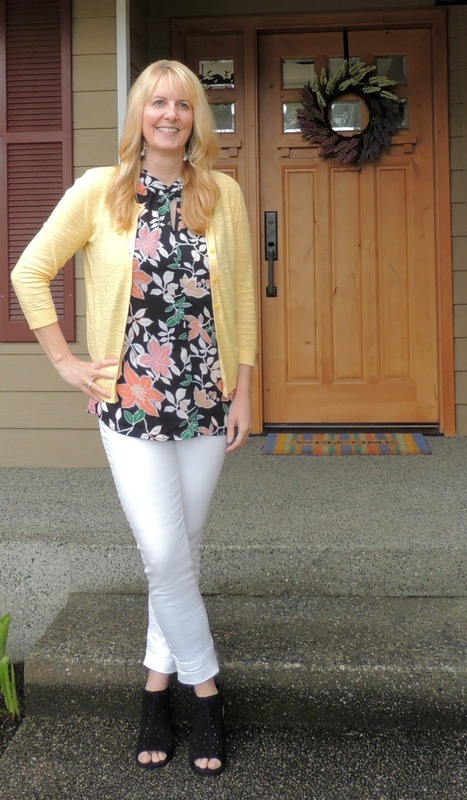 The yellow cardigan with your dark florals is absolutely perfect Lana!! Talk about lightening it up and calling out for spring!! Thanks Jodie. Yes, she thinks they look old fashioned. I've tried showing her that they're very fashion forward right now but she's just not buying it! Cute lemons and floral are so channeling Spring! You look adorable in both and make me smile. It’s 31 here right now but the sun is shining, lol. Brrrr!!! The sun finally came out today and I was so happy. Maybe my lemons worked! Hahahahaha the 96th of January - I love it! You look darling in your Spring florals! I hope warmer weather is in your near future! It's looking promising for next week - fingers crossed! I always like darker florals for this time of year! This is such a pretty combination with the white jeans and yellow cardigan! Always love you in yellow and the dark floral is gorgeous! This sweater has been around forever but it goes with so many things! I'd say- hey, come visit me to get out of your weather, except you can still build snow forts here. Bah. I like dark florals. I'm wearing them today. And the lemons! So awesome. I think I just thought we were the only ones getting eternal winter, but now I hear about it from west coast, to even the south (!?) San Diego and Florida are still chugging along perfectly, though.. I love the little lemon top! It's so cute and a great option for spring!